In 12-inch skillet, heat oil over medium heat. Cook turkey and onion in oil 8 to 10 minutes, stirring frequently, until turkey is no longer pink; drain. In 3- to 4-quart slow cooker, mix turkey mixture and remaining ingredients except rice. Stir in rice. Increase heat setting to High. Cover; cook about 15 minutes or until rice is hot. Do you have ground beef in the freezer? Use it instead of the turkey, plus you won't need to use oil when you cook it. Stir in either brown or white rice at the end. Stir in either brown or white rice at the end. This is a low-fat chili because it is made with ground turkey breast. Check that you are buying ground turkey breast and not regular ground turkey, which includes both light and dark meat and will be higher in fat. 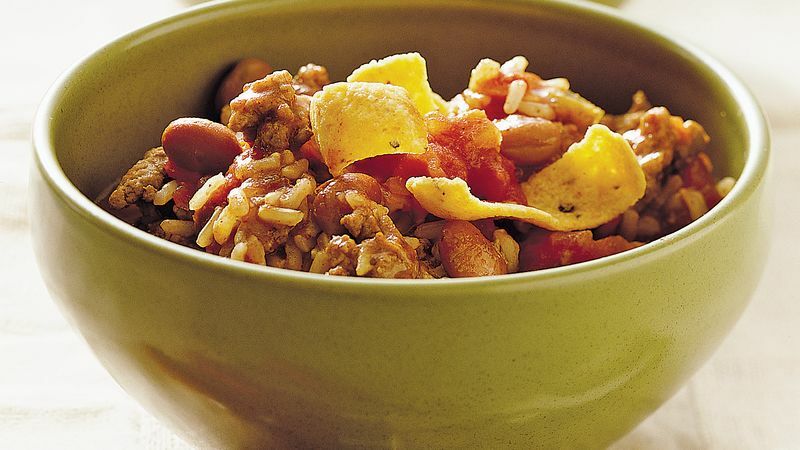 Enjoy this chili topped with your favorite salsa and corn chips.